Publicity Stills of "Football Hooligans"
Expelled unfairly from Harvard, American Matt Buckner flees to England to his sister's home. Once there, he is befriended by her charming and dangerous brother-in-law, Pete Dunham, and introduced to the underworld of British football hooliganism. Matt learns to stand his ground through a friendship that develops against the backdrop of this secret and often violent world. Football undeniably is the best loved sport in the world. Fans of the sport, regardless of loyalty, are able to speak the common language of the game. While football fans are the most passionate lot in the world, obsession has marred the beautiful game from time to time. It is bad enough the authorities have to deal with racism within the stadium, hooliganism has controlled the world outside the stadium walls. This film is exactly about that. Do not expect the magic of banana kicks or thunderous volleys; prepare yourselves for blood, passion and grit. Expelled from the prestigious Harvard University, journalism student Matthew Buckner (Elijah Wood) decides to drop in on his sister Shannon (Claire Forlani) in London, to stay for a while. 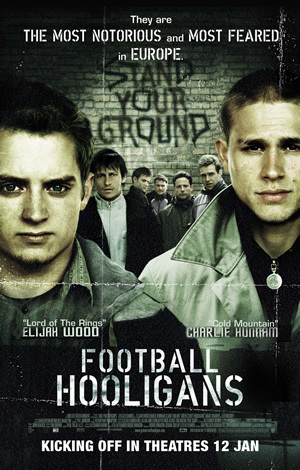 Sent by his brother-in-law, Steve, to watch a football match with Steve’s younger brother, Petey Dunham (Charlie Hunnam), Matthew soon discovers that there is more to supporting a club than just singing songs. Driven by the adrenaline of hooliganism, Matthew soon finds himself fitting in comfortably with the GSE (Green Street Elite), led by Petey. Rising through the ranks in a short time, his presence in the GSE, Matthew gains notoriety as “The Yank” and the GSE finds itself being restored to its prestigious days. Football Hooligans also explore the trials and tribulations of running and maintaining a firm, or to put it bluntly, a gang. In the film, Petey explains to Matthew about how firms, like the GSE for example, prove their support and allegiance to their clubs. As the film progresses, the audience will understand better how and why these firms exist, an area never fully explore before in film. Fresh from his stint as the cannibalistic Kevin in Sin City, Elijah Wood visits the darker territory yet again in Matthew Buckner. Appearing all naïve and innocuous for not trying to disprove his wrongful expulsion by the university (they were his roommate’s drugs, not his) in the beginning, Matthew’s gradual metamorphosis into a rebel is just plain sinister. Elijah Wood’s performance is top notch and he is very well complemented by Charlie Hunnam who plays Petey, the young leader of the GSE. This is very apparent when they engage in banter like “it’s football not soccer” and digs at other English clubs. Petey, appearing all brash and gregarious in the beginning, ends up being the one with a heart yet having to lead the GSE towards being the most feared firm in England. Hunnam fits the cocky, confident and charismatic Petey to a T. The acting by the supporting cast is also commendable. Avoiding the clichéd love interest bit to distract Petey and/or Matthew, the film moves at a linear pace, ensuring the message is delivered straight to the point. The themes of family and filling in others’ shoes play a major role in the climax of the film in which the GSE and their bitter rivals from the town of Millwall finally meet and clash. If you were impressed by the blood play present in Quentin Tarantino’s films, then you would love the constant flurry of blood throughout the film. While Tarantino’s works were flashy and cool, the blood seen in Football Hooligans is so real; you can feel the iron searing your lips. “I’m forever blowing bubbles, pretty bubbles in the air,” echoes throughout the stadium, pubs and streets of West Ham. Songs as such are sung by football fans around England and the world. And from now on, songs of praise shall be sung of Football Hooligans, the film.